Get expert advice on a LGV/ HGV accident claim with a free, no obligation consultation. Being involved in any accident with a motor vehicle can be a terrifying and physically damaging experience, but road accidents can be many times worse if they involve an articulated lorry or large goods vehicle (LGV). Simply because of the larger size of these vehicles and the likely force of an impact in the event of a collision, accidents involving large goods vehicles (which may be better known as heavy goods vehicles) are more likely to result in higher levels of damage and more serious injuries to those involved. If you have been involved in an LGV accident which was not your fault, then you may be eligible to seek compensation through a LGV accident claims case. LGVs can be lethal weapons if they are not driven properly, which is one of the reasons that large goods vehicle drivers in the UK need to have specific driver training to gain a special license before they are permitted to drive them. However, even if a driver has passed all of the required tests, human error can still cause serious accidents, as can mechanical errors which affect the vehicles themselves. Although it is illegal to use a mobile phone whilst driving in the United Kingdom, some drivers still use them whilst on the road as I’m sure many of us will have noticed. Mobile phone use can distract the driver, making them much less aware of what is going on around them. This greatly increases their chances of being involved in a road traffic collision. Many lorry drivers are required to work anti-social hours or asked to drive for long stretches at a time. Commercial lorry drivers are advised to take regular refreshment breaks and make sure that they get enough sleep before a journey. A responsible lorry driver should always stop and rest if they feel tired, however many large goods vehicle accidents still occur when drivers fall asleep at the wheel. Even when it’s just for a millisecond this can be a lethal error. Accidents can also happen if a driver falls asleep due to alcohol consumption or taking drugs, including certain over-the-counter medications which can cause drowsiness. 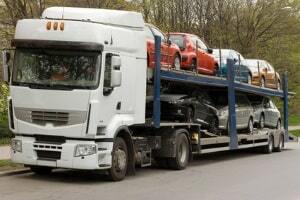 If LGVs have not been loaded properly, they can become seriously unstable. It is possible that the whole vehicle could tip over, or the goods which are being transported could topple off of the side and cause injury as the vehicle is moving. It is the responsibility of haulage companies and their drivers to ensure that any goods which they are transporting are loaded correctly, safely and securely. Driving too close to the vehicle in front can cause serious problems if the vehicle in front has to stop suddenly, because the vehicle behind will not have time to stop safely, especially when the road or weather conditions are poor. These problems can be exacerbated if the vehicle behind is a LGV because the average stopping distance is much higher than that of a family car just because of the extra weight of the vehicle. Many LGV accident claims are raised after incidents in which vehicles try to travel under bridges which do not have a high enough clearance for them. It seems like a simple error but is surprisingly common. Lorry drivers should always be aware of the height of their vehicle and road signs advising about low clearance bridges. Pedestrians and other vehicle users can be very easily injured in incidences where a lorry hits a bridge. Haulage companies have a responsibility to ensure that their vehicles are properly maintained and have had all of the necessary checks carried out on them. Due to the size of the vehicles, the weight of their loads and the average distances which are travelled by large goods vehicle’s on a yearly basis, these vehicles may require extra maintenance. However, poorly maintained vehicles actually cause a large number of serious incidents every year. If you have been involved in an accident with a large goods vehicle, contact a specialist in LGV accident claims to see what they are able to do for you. Even if your accident did not involve one of the circumstances which are mentioned above, there is a good chance that you will be able to make a claim.